SIUE solar car team advisor Andy Lozowski, PhD, professor of electrical and computer engineering in the SOE, noted the timeliness of SIUE hosting the event. “Nowadays, we see increased interest in self-driving car technology, automotive navigation systems and the ‘smart-city’ aspect of transportation,” he said. “All these technologies will be based on electric cars. Group meetings will be held in the Morris University Center’s Meridian Ballroom or in the second floor conference center. Breakout sessions will be held in the SOE building. 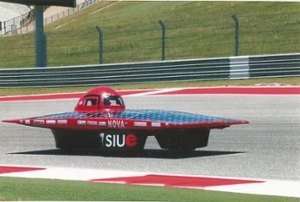 Five solar car teams will bring their vehicles to be displayed in the SOE building atrium. The Innovators Educational Foundation is an organization devoted to educational opportunities where students are challenged with hands-on learning experiences in the areas of science, engineering and technology. Students are encouraged to be innovative with ideas that will lead to developing better solutions to society’s challenges faced both in the U.S. and internationally. Its mission is to engage young minds with the hope of developing world leaders in these critical areas.